August 16, 2012 — The TOMODACHI Initiative, the Sports Camp of America (SCOA) and O.G.A. 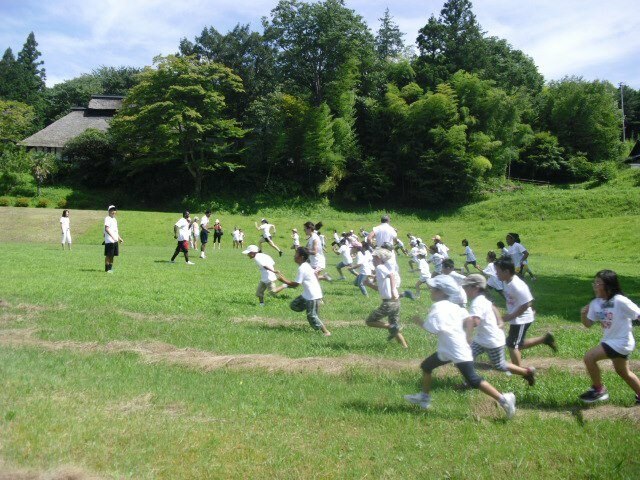 FOR AID are pleased to announce that 40 children between the ages of 6 and 12 from Minami-Sanriku, Miyagi Prefecture, participated in an American-style summer camp on August 15-16, 2012. The summer camp took place at the San San Kan in Minami-Sanriku, a town that was devastated by the earthquake and tsunami that struck Japan on March 11, 2011. The boys and girls from Minami-Sanriku had the chance to play American football, frisbee, soccer, and cheer dance while simultaneously practicing their English in a fun and challenging environment. They were also introduced to traditional American camp activities and games such as “capture the flag,” potato sack races, balloon tosses, and making the delicious treat of “s’mores” around the campfire. SCOA has been giving Japanese children an American summer camp experience for the past eight years. SCOA is unique in Japan in that all of the camp counselors are American university students with sports and cheerleading backgrounds. This summer’s counselors included eight athletes from the University of California, Berkeley; the University of California, Davis; and the University of Southern California. Their sports included swimming, football, soccer, tennis, gymnastics and rowing.